Thursday, September 28, 2017 Fabrice Lehoucq, Department of Political Science: “Left- and Right-Wing Populism”. Friday, October 20, 2017, Dr. David Wharton, Department of Classical Studies: “Tyrants and Demagogues: Proto-populism in Ancient Greece”. Thursday, November 16, 2017, Dr. Jonathan Zarecki, Department of Classical Studies: “The People Have No Power Until They Do, and Even Then They Don’t: Why the People Are Bad for a Republic”. Thursday – Friday, Feb. 15, 2018, Dr. Cas Mudde, University of Georgia: “Are We Living in a Populist Era?” (public lecture). Wednesday, February 21, 2018, Dr. Kurt Weyland, Department of Government, University of Texas at Austin: “President Trump’s Populism: Lessons from Latin America and Europe” (public lecture). Friday, March 2, 2018, Dr. Omar Ali, Department of History and Dean of the Lloyd International Honors College, “Black Populism, African Americans, and Independent Politics”. Thursday, March 15, 2018, James Anderson, Head, Department of History, “”Populist Sentiments in pre-Maoist Chinese Marxist Ideology and Xi Jinping Era Nationalism”. Friday, April 6, 2018, Dr. Kathleen Macfie, Department of Languages, Literatures, and Cultures and editor, International Poetry Review, “Populism and Putin’s Russia”. We were able to bring Prof. Cas Mudde (School of Public and International Affairs, University of Georgia), an internationally-recognized scholar of populism, to visit campus on Feb. 15-16, 2018. He gave a public lecture that was well-attended by the Ashby group as well as by other students and the general public, and which sparked a lively post-lecture discussion. Afterwards we took him to dinner with several Ashby faculty and students, and the next day he visited an upper-level undergraduate Political Science class to discuss populist developments in the European Union. We were also able to partner with the Department of Political Science, which co-advertised Mudde’s visit, and who invited our Ashby scholars to attend a related lecture by another internationally-known scholar of populism, Prof. Kurt Weyland (Department of Government, University of Texas at Austin). Each speaker had different perspectives on populism, which gave our participants excellent insight into the problems and methods involved in understanding the phenomenon. Student participation was good, although it waned somewhat as the year wore on. However, several stalwarts attended consistently and participated meaningfully in discussions. 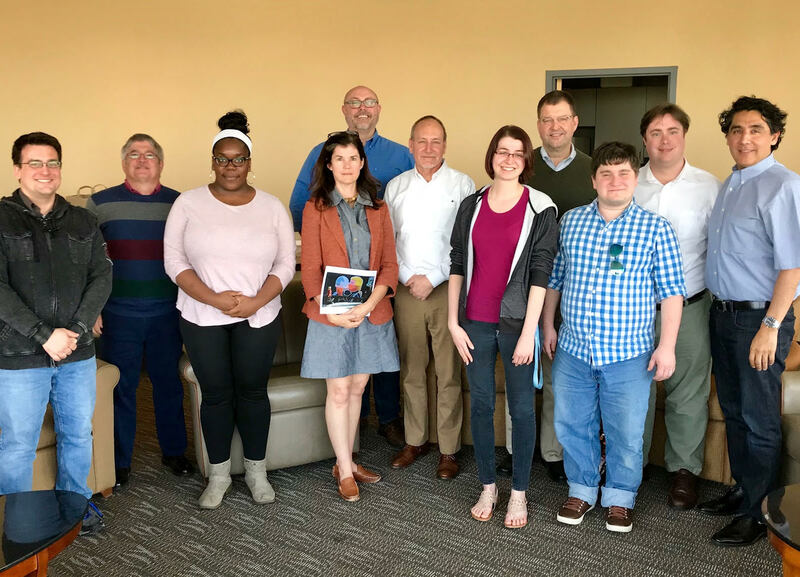 Our ten student participants were from the Departments of Classical Studies, Political Science and History, including two graduate students and eight undergraduates. We spent $1,996 of our $2000 budget, on travel, food, and lodging for Prof. Mudde’s visit, on copies of Cas Mudde and Rovira Kaltwasswer’s book Populism: A Very Short Introduction (Oxford 2017), which was distributed to all participants, and on food and drink for each of our seven regular Ashby meetings. We believe faculty and students alike felt that our Dialogue was consistently engaging, interesting, and informative. All the participants agreed that the Dialogue was well worth their time, and that they had learned about fields history and politics about which they previously knew little or nothing.